27" iMac: You Need This Computer! Why Go Pro When iMac Goes Faster? "Reports are flowing in that some of the recently-shipped iMacs with Core i7 Intel processors are shipping dead-on-arrival. Whoops. "A currently 36-page thread on Apple's official support Forums has a whole slew of unhappy customers listing their already-deceased desktops. Many of them cite cracked screens or just dead computers, and one even cites a footprint on the screen!" "Apple's new Core i7-based iMac might be a performance monster, but it looks like the whole family's having some problems getting out of the gate: in addition to the previously-noted performance issues with the Core 2 Duo models, a quick glance across Apple's support forums and on other Mac boards around the web reveals that some machines are showing up DOA and / or with cracked screens. We're a little more familiar with the DOA issue, since the new i7 we just bought doesn't boot at all...."
"As we noted in an article soon after the new iMacs were released, they seem to be shipping with many problems. Then, it was Flash and system resource corruption. Now, it seems as though the Core i7 iMacs are shipping DOA or with cracked screens. Several Mac media outlets are reporting an abnormally large amount of complaints surfacing from reception of the new all-in-one from Apple...."
"Apple's new top-of-the-line 27-inch iMac with an Intel Core i7 processor has shown up dead on arrival or with a cracked screen for some who have purchased. "In addition to threads on the Apple Discussions support section, Engadget also received a quad-core machine that would not boot when taken out of the box." "Is there a more underappreciated part of your desktop computer system than the keyboard? It's the second-most-used component - after the display, of course - and yet many people are still using the keyboard that came with their Mac. "That's a shame, because today's keyboards have a lot to offer . . . [and for] laptop users; if you spend much time using your laptop at a desk, a separate keyboard and mouse can do wonders for your posture and health. "...here are our tips for buying a new keyboard...."
"All hail the humble mouse . . . the only peripheral you caress for hours a day (you only tickle your keyboard), but you may have never thought of replacing the limited Apple Mouse or Magic Mouse that shipped with your Mac or pondered augmenting your 'Book's touchy trackpad. "We're in the Golden Age of Rodents . . . It's time to look at the mice you're missing. However, the wealth of choices can be daunting. We have a few tips to help you...."
"Sadly, obsolete gadgets have to be replaced. Happily, change is good. This is what happened to Jerry Seinfeld's ever-present classic Macintosh which, after all these years, has been replaced by a new iMac." MacFixIt's Topher Kessler notes that sometimes you may need to reinstall OS X on a computer with a broken optical drive, resulting in an obvious problem with reading the installation DVD. While broken drives can be easily fixed or replaced, it does take your computer out of commission for the time it takes the repairs to be done. Meanwhile, there are a few alternative approaches to reinstalling OS X that may work. Three of seven suggested solutions use FireWire Target Disk Mode. To leave Target Display mode, press Command + F2 on the keyboard of the 27-inch iMac that is in Target Display mode. To return to Target Display mode, press Command + F2 again. To complete the firmware update process, please follow the instructions in the updater application (/Applications/Utilities/LED Cinema Display iSight Camera Firmware Update.app). 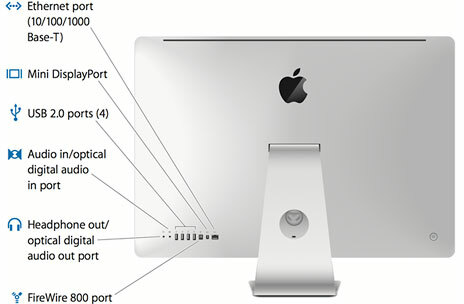 Learn about the external features, ports, and connectors on the iMac (Late 2009) computers. All ports and connectors described in this document are located on the Input/Output (I/O) panel on the bottom-right side on the back of the computer. The built-in SD slot allows the iMac (Late 2009) to read and write data to SD media. The slot accepts cards that are Standard SD (Secure Digital) 4 MB to 4 GB and SDHC (Secure Digital High Capacity) 4 GB to 32 GB. For complete information on the SD card slot, see About the SD card slot. The internal microphone operates independently from all other audio input ports and is always available. The internal microphone supports recording at bit depths of 16, 20, or 24 bits per sample and at sample rates of 44.1 KHz, 48 KHz, or 96 KHz. Audio recorded from the microphone is presented as a stereo data stream with the same data on both the left and right channels. You can adjust the microphone gain from -16 dB to +30 dB. Video chat using iChat over a broadband connection, take pictures using Photo Booth, or capture video through iMovie HD. The camera has an indicator light that glows when the iSight camera is in use. The SuperDrive can read CD-ROM, photo CD, audio, and DVD discs. It can write to CD-R, CD-RW, DVD±R, DVD±RW, and DVD±R Double-Layer (DL) discs. The infrared-based Apple Remote (sold separately) works with the built-in IR receiver for use with Front Row to access DVD Player, iPhoto, iTunes, and QuickTime Player. With video mirroring, you can see the image that is on the iMac flat-panel display on an external monitor, television, or projector. Connect an external display and use that area in addition to the built-in display for your desktop. The Mini DisplayPort video port on the 27-inch iMac also supports video input from DisplayPort compliant sources. Use the 27-inch iMac display as an external display for another computer, like a MacBook Pro. Return to the iMac screen by pressing Command + F2 on the keyboard. Note: Requires Mini DisplayPort to Mini DisplayPort cable or a converter that converts other electrical, video and audio protocols to DisplayPort compliant signals. Read more about using this feature in Using a 27-inch iMac as an external display. The iMac (Early 2009) has a built in Ethernet port for 10Base-T/UTP, 100Base-TX, and 1000Base-T Gigabit operation. You can connect your iMac to an Ethernet cable from a cable or DSL modem, hub, switch, or router, or to another Macintosh computer. The connected device can be either a 10Base-T, 100Base-T or 1000Base-T device; the port automatically detects which type of device is connected. You don't have to use an Ethernet crossover cable to connect to other Ethernet devices. The back of the iMac (Late 2009) has a total of four USB 2.0-compliant ports. You can connect both USB 2.0- and USB 1.1-compliant devices to these ports. The USB 2.0 ports support both low-speed, full-speed, and high-speed data transfers, up to 1.5 megabits per second (Mbit/s), 12 Mbit/s, and 480 Mbit/s respectively. The aluminum Apple keyboard has a USB hub with two high-speed USB 2.0 ports. All the USB ports use USB Type A connectors, which have four pins each. The analog line input operates independently from all other audio input ports and is always available. The line input supports recording at bit depths of 16, 20, or 24 bits per sample and at sample rates of 44.1 KHz, 48 KHz, or 96 KHz. Audio recorded from the line input is presented as a stereo data stream. You can adjust the line input gain from -16 dB to +30 dB. The headphone output is automatically selected for audio output if no external S/PDIF optical digital output device is detected. The headphone output supports a stereo data stream at bit depths of 16, 20, or 24 bits per sample and at sample rates of 44.1 KHz, 48 KHz, or 96 KHz. The headphone output volume can be adjusted from 0.0 dB to -64 dB. The iMac has one FireWire 800 port supported by an Open Host Controller Interface (OHCI) FireWire controller with a FireWire 800 PHY (Physical Layer). 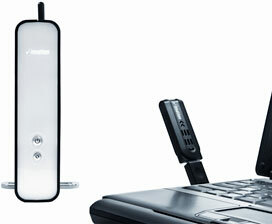 The FireWire 800 port supports IEEE 1394b with a maximum data rate of 800 Mbps (100 MBps). The iMac (Late 2009) works with 7W for the port. "With the advent of Apple's all-new 27 inch iMac my digital-life just got much, much, much better and easier!!!! Everything is very close to instantaneous on the all-new iMac, which makes it feel like the computer actually understands me or can read my mind!!!" 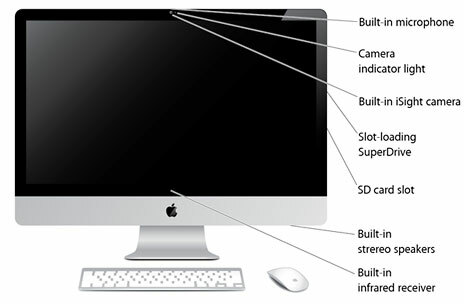 "The all-new 27 inch Apple iMac is Off-The-Richter-Scale Unbelievable!!!! Crazy, Stunningly Amazing, Over-The-Top, Beautiful, Off-the-hook, Astounding, Stupefying, Breathtaking, Awesome, Spectacular, Phenomenal, Extraordinary, Jaw-Dropping, Wondrous, Pure, Incredible, Delicious!!!!!!!!" Link: The All-New Apple 27 inch iMac - You Need This Computer!!!!! Macworld's James Galbraith more restrainedly says that the new top-of-the-line iMac takes the crown as fastest stock Mac model ever. The new high-end 27-inch iMacs are the first to use Intel's Core i5 and Core i7 quad-core processors. Comparing the Core i5 iMac's Speedmark 6 scores to its iMac siblings, the Core i5 iMac was 27% faster overall than the second-fastest iMac Macworld has tested and has a MathematicaMark score more than twice as high as the 3.06 GHz dual-core iMac. That's a lot of performance bang for an extra $200! And the built-to-order Core i7 iMac showed even greater performance prowess! Macworld's Rob Griffiths says that while the Mac Pro has always been something of a niche product, appealing mainly to those who need vast amounts of internal storage (thanks to its four drive bays), expansion (three PCI Express slots) or memory (32 GB on eight core models), with the introduction of the new iMacs - and in particular the Core i7-powered 27" model - it seems the Mac Pro's niche may have gotten smaller. Link: Why Go Pro When iMac Goes Faster? "We had a chance to test the new 27" 3.06 GHz iMac. First off, let's just get it out of the way and state that this is a large computer that arrives in a huge box, and it's pretty heavy. Ok, that said, our initial reaction is wow. What a display. In either the 27" model we tested or an available 21.5" display, these iMacs are the first to feature LED-backlit displays with a widescreen 16:9 aspect ratio for HD. While some may not like the glossy external treatment, the new displays feature rich colors and are extremely sharp. We could get lost in them all day...."
"While early attention focused on the 27-in. model... the base 21.5-in. model is attractive in its own right. The entry-level model comes with a powerful 3.06 GHz Intel Core 2 Duo processor, 4 GB of RAM, a 500 GB hard drive and the same Nvidia 9400M video card that shows up in many of Apple's laptops and the Mac mini. Recession-crimped holiday shoppers will want to note that it starts at $1,199 - $500 less than its big brother...."
"With Apple's latest update to the Mac mini in October '09, the $799 Mac mini includes a 2.53 GHz Intel Core 2 Duo processor, 4 GB RAM, and a 320 GB hard drive, while the $599 model comes with 2.26 GHz Intel Core 2 Duo processor, 2 GB RAM, and 160 GB hard drive. Five USB 2.0 ports are included as well as one FireWire 800 port, Gigabit Ethernet, and digital optical plus analog audio in/out. Mini-DVI out is included as well as the new Mini DisplayPort. Build-to-order options include hard drives up to 500 GB, 4 GB of memory, and a 2.66 GHz CPU. "The Mac mini's petite 2-inch-tall, 6.5-inch-square anodized aluminum form factor remains essentially unchanged from when it was first introduced as a PPC G4 machine. The main change with the new minis are faster Intel Core 2 Duo processor, more RAM, and larger hard drives, so a real-world performance boost of 25% - 30% should be achievable. It's a substantial improvement over the previous models. "The Mac mini actually has a lot more in common with the MacBook than its desktop Mac stablemates. For instance, Mac minis come with 2.5" 5400 RPM laptop type hard drives rather than the higher-performance 3.5" 7200 RPM desktop drives that are pretty much standard in desktop computers these days. The mini also has a typical laptop array of I/O ports, a laptop-style optical drive, and the mini CPU weighs a pound and a half less than the lightest laptop Apple ever made. Apple saves space by moving the power supply unit out of the computer, so the power cord contains a rather large brick." Macworld's Jason Snell reports that Apple's new Mac mini with Snow Leopard Server is attractively priced and has enough processing power for small businesses, small workgroups in larger enterprises, and educational environments, and that the inclusion of Mac OS X Server 10.6 - which Apple sells separately for $499 0 makes the Mac mini server a fantastic deal, although its lack of an optical drive (it does support the $99 MacBook Air SuperDrive) and use of laptop-type 2.5" hard drives hampers speed. "My client was amazed at how quiet the Mac mini Server is. That's one of the reasons that I think it's going to be a huge success in small office environments. It's tiny, it can sit 'headless' on a shelf or desktop providing services to a workgroup, and it makes so little noise that it's a good thing there's that tiny white LED on the front to let you know it's running." PR: iFixit announces the release of over two hundred repair guides, covering every Mac mini and most iMacs produced by Apple since 2004. All iMac and Mac mini repair manuals are immediately available for free on iFixit.com. The repair manuals include in-depth disassembly guides, model identification tips, troubleshooting techniques, and upgrade information. The 241 new repair guides use 1,452 photos to clearly communicate each step of the repair. iFixit repair guides are well known for world-class photography and clear, concise step-by-step directions. iFixit is also launching an iMac parts store with hard drives, RAM, power supplies, disassembly tools, and more. Pressed for comment, CEO Kyle Wiens admitted that: "We have been pummeled with requests for iMac parts for years, and I finally couldn't take it anymore. That's right, we are now accepting money in exchange for iMac parts." The repair manuals cover all 17" and 20" iMacs manufactured since 2004, including both G5 and Intel models. 184 iMac repair guides use over 1,000 photos to illustrate the process of diagnosing and repairing each machine. They cover all aspects of the iMac, including removing the glass panel, upgrading the RAM and hard drive, and replacing the logic board. 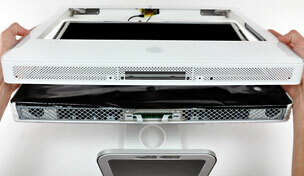 The iMac parts store includes RAM, hard drive, and optical drive upgrades, as well as replacement parts such as power supplies and glass panels. The repair manuals cover all iterations of the Mac mini since its inception in 2005. The list includes G4, Intel Core Solo, Core Duo, and Core 2 Duo machines. iFixit's experts have completed a total of 57 Mac mini repair guides. They cover accessing every part inside the Mac mini, including replacing the RAM, swapping out the wireless card, and removing the logic board. Mac mini parts include RAM, hard drives, and optical drives, as well as enclosures allowing the installation of two internal hard drives. Over a thousand repair manuals for all iPod, iPhone, and Mac laptops are also available free online at iFixit.com/Guide. iFixit enables self repair. As the leader in the DIY Apple repair community, iFixit is dedicated to helping people everywhere keep their Macs, iPods, and iPhones running longer. For more information, visit: www.iFixit.com or call 1-866-61-FIXIT. PR: Razer, a leading manufacturer of high-end precision gaming and lifestyle peripherals, has announced the Razer Imperator, a right-handed ergonomic mouse for palm and fingertip gamers. The Razer Imperator is designed with gaming-grade ergonomics in mind - contours and grooves specifically crafted to enhance aggressive mousing movements made by gamers. 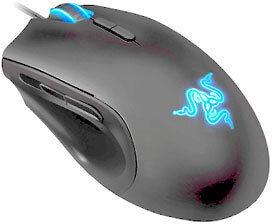 "Ergonomics and control were the key objectives with this mouse" says Robert "Razerguy" Krakoff, president, Razer. "Your grip stays locked and planted no matter how often you lift and swipe your mouse while playing. One of the typical complaints of gamers is the difficulty in reaching the side or thumb buttons on a mouse. We have pioneered adjustable side buttons that slide and lock into your ideal thumb position. You just can't get a more custom tailored fit than the Razer Imperator." Contoured for comfort, the Razer Imperator delivers gaming-grade ergonomics that reduces strain during extended gameplay and provides added grip during aggressive mousing movements. The Razer Imperator also features Razer's first adjustable side buttons to ensure customized positioning for a variety of hand sizes and gaming grips. In addition to its ergonomically-designed form factor, the Razer Imperator comes armed with the 5600 dpi Razer Precision 3.5G laser sensor for nothing less than pinpoint precision. PR: Imation Corp. has announced US availability of its much-anticipated Pro WX Wireless USB hard drive. Built on Imation's award-winning platform of external hard drive products, the Imation Pro WX drive is the world's first Wireless USB external hard drive. Offering the convenience of fast data transfer rates, speed, and capacity required in today's graphics and data intensive environments, the Imation Pro WX hard drive provides 1.5 TB of storage capacity for digitally driven users who crave the freedom of the wireless workspace. Imation will demonstrate the Imation Pro WX hard drive at the Pepcom Wine, Dine & Demo media event at the Hammerstein Ballroom at Manhattan Center Studios tonight from 6 to 9 p.m.
Imation's Pro WX Wireless USB hard drive provides a unique combination of speed, capacity and security in a convenient 3.5" form factor. With a fast Wireless USB data transfer rate of up to 15 MBs/second, the product can back up a typical CD in under 50 seconds, and store up to 300,000 photos or 750 hours of video. Inherent in its Wireless USB technology, Pro WX wireless hard drive offers an innovative one-to-one connection that limits the possibility of signal interception and securely backs up data whenever it is in range up to 30 feet, similar to a direct attached storage device. "Imation continues to be a world leader in delivering innovative storage products designed for our increasingly wireless world," comments James Depuydt, director of technology, Imation. "We are now the first to provide users with a Wireless USB hard drive to continuously back up their most critical data in a unique product design. We will continue to expand our wireless storage capabilities to enable our customers to easily create, store, manage and share digital information." The Imation Pro WX Wireless USB hard drive comes complete with an integrated stand for vertical or horizontal orientation; low capacity/data activity indicator lights for easy identification of data processes with built-in sleep mode for energy conservation; and one-touch, backup sync buttons for easy-to-use automatic backup of data, photos, music and videos. 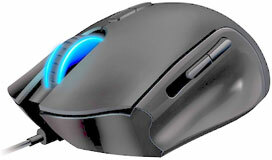 The product is compatible with both PC and Mac operating systems and doesn't require batteries. "With the launch of the Pro WX, Imation delivers a differentiated approach to address the specific needs of those users who desire or need to connect, store and protect data using a plug-n-play wireless USB drive that provides a capable and secure alternative to cabled solutions," said Liz Conner, research analyst, IDC. Imation also announced its next-generation SSD Upgrade Kit. The Imation Pro WX wireless USB hard drive is currently available for an MSRP of $449.99 through authorized Imation distributors, wholesalers, resellers and e-tailers in the United States. PR: Samsung Electronics Co., Ltd. has announced the Story Station Plus, its new lineup of 3.5" external hard drives featuring an external serial ATA (eSATA) interface to allow lightning fast data transfer. The 3.0-gigabit per second (Gbps), high-performance drives are available in up to 2-terabyte (TB) densities, providing consumers with a high-performance external storage solution. "Samsung new line of high-density solutions with the eSATA interface give users the speed they need for demanding tasks like photo and video editing, plus safely storing multimedia content libraries," said H.S. Lee, vice president, storage marketing, Samsung Electronics. "The 2 TB density Story Station Plus drive can store the data equivalent of 500,000 MP3 music files, 560,000 digital photo images, or 880 hours of high resolution video." The addition of the eSATA interface raises the data transfer speed of the Story Station Plus series by more than six-fold when compared with models using a USB 2.0 interface, the standard connector for most external hard drives. Offering greater flexibility, Story Station Plus users can utilize either the 480 megabit per second (Mbps) USB 2.0 or the 3.0 Gbps eSATA interface, satisfying consumers' needs for higher performance from their external storage devices. The Story Station Plus lineup will also feature Samsung's low standby power design that reduces the standby power by 96 percent to 0.1 watts (W) from the conventional 2.5W. The reduced standby power level meets requirements for the forthcoming European Union EuP (Energy Using Products) Directive for Standby Regulation, effective January 2010. 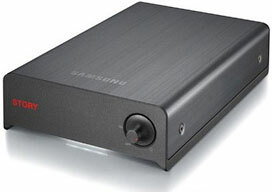 Samsung's 3.5" Story Station Plus external hard drive is available in densities ranging from 1 TB to 2 TB. The aluminum outer casing not only provides a chic design but contributes to effective heat dispersion. Key features include Samsung Auto Backup for ongoing data preservation, SecretZone™ software for personal data encryption and SafetyKey™ for password protection. The Story Station Plus drives will be available globally by the end of November 2009. The Story Station Plus features a three-year limited warranty, and the 2 TB version has a $299 MSRP. "Now that we've got upgrade installation videos for the Late 09 MacBook and iMacs, we are turning our attention to the other upgraded model the Mac mini. While we re hard at work on the upgrade videos for the new Server model, those of you with the standard mini aren't being left out in the cold. In fact, the videos for your mini are ready to go! "As it turns out, the internals of the Late '09 mini are identical to those of the Early 09 model. That means the take-apart is exactly the same, too. So whether you want to put in a larger hard drive or bump up the RAM, the free video instructions can be found both in our Tech Center and on our YouTube channel. "Of course, if you decide after watching the process, you'd rather have this upgrade professionally done, we can help you out there, too. Our Installation Service offers swift turnaround and professional results, all at a reasonable price. "Even though your Mac mini isn't one of Apple's flagship products, it doesn't mean it can't be a heck of a workhorse. Maximize your mini's performance with upgrades and a little help from OWC." PR: Browse multiple Web sites in one split-view window with Cruz for Mac OS X based on Safari WebKit with Twitter built-in. With Cruz you can view your Twitter Timeline and "@" Mentions in a split pane while browsing other sites. 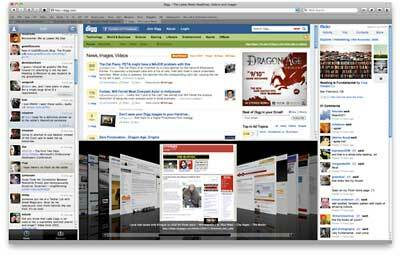 The new social browser for Mac OS X with Twitter built-in, Cruz lets you view your Twitter Timeline and "@" Mentions in a split pane while browsing other sites. Cruz also allows you to open links from your Twitter Timeline in new tabs or browse multiple pages simultaneously in split views. Cruz has an open plugin API for extending browser functionality. New Twitter Plugin built-in. View your Timeline and "@" Mentions from a split view directly in the browser. And open Twitter links in new tabs.